If you are a veteran or first responder who is interested in applying for a service dog, please review the following information to determine if you meet our eligibility requirements. You have served in any of the branches of the U.S. Armed Forces from any era, and have received an honorable discharge. You are a first responder who has a work related disability. You are visually or hearing impaired or physically disabled. You can participate in our two-week training program and will be committed to our training program and schedule. You are able to meet the physical and emotional needs of a dog, and have an appropriate support system in place to do so if/when you are unable to yourself. Also eligible are professionals working with Military organizations that provide physical or mental health care to clients who will benefit from interaction with an Assistance Dog. Our PTSD service dog program is limited to veterans with combat-related PTSD and first-responders with work-related PTSD. If you are a veteran or first responder who is interested in applying for a guide dog, please review the following information to determine if you meet our eligibility requirements. We accept residents of the United States who are classified as legally or totally blind. We require that each student have the ability to independently travel using their current mobility device. Applicants must also be physically able to work with a guide dog and also be able to care for their dog. If an applicant has successfully completed O & M training within the past several years, we will request an O & M instructor's report. Some exceptions to residency are considered on a case-by-case basis. All services are provided at no cost to clients — this includes your dog, transportation to and from our campus in Smithtown, New York, instruction, and more. If you have any questions about our programs, please reach out to the America's VetDogs Consumer Service office at 866-282-8047 or ConsumerServices@VetDogs.org. A service dog is specially trained to help veterans who have disabilities other than visual impairment. A service dog can be trained to provide balance, retrieve dropped items, open and close doors, turn on and off lights, carry a backpack, and much more. Learn more about the Service Dog program, including admissions information. A service dog for post traumatic stress disorder is trained to help mitigate the symptoms of PTSD by providing the emotional and physical support a veteran may need. A service dog for PTSD can be trained to interrupt a night terror, retrieve an item, get help and much more. 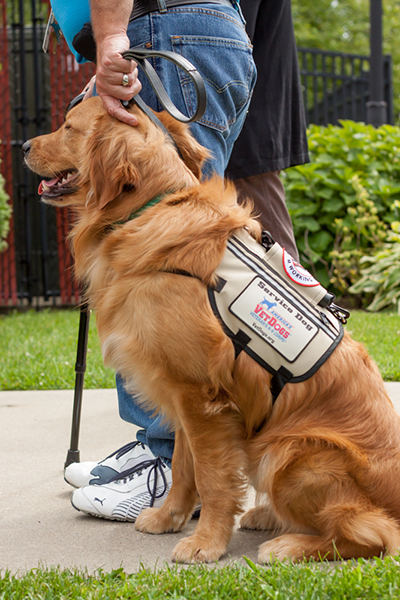 Learn more about the Service Dog for PTSD program, including admissions information. Our service dog for PTSD program is limited to veterans with combat-related PTSD and first-responders with work-related PTSD. A guide dog is trained to find and follow a clear path, maneuver around obstacles, and stop at curbs. A veteran with a guide dog gains enhanced mobility and independence. Learn more about the Guide Dog program, including admissions information. These specially trained dogs, spend time working with wounded veterans recovering at military hospitals and veterans medical centers. Dogs work with physical and occupational therapists as they treat soldiers and become an essential part of the healing process. 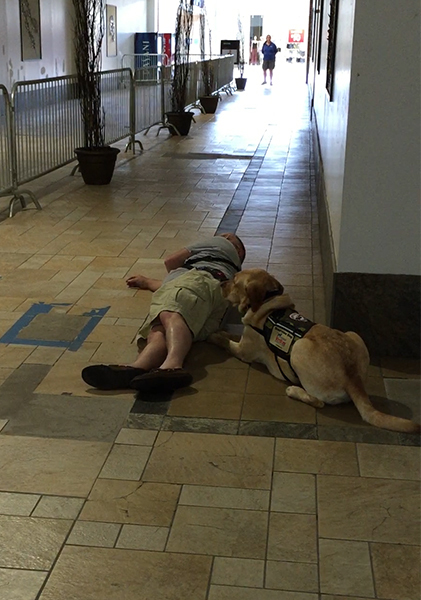 Seizure response dogs are trained to perform special tasks following a seizure to assist its handler. These tasks may include getting help, operating a call button or k9 phone, or retrieving medication. Learn more about the Seizure Response Dog program, including admissions information. If you are not a veteran, please reach out to the VetDogs Consumer Service office at 866-282-8047 to learn about your options. 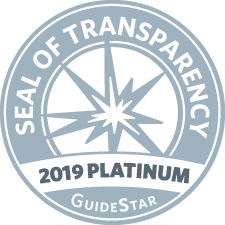 America’s VetDogs and its related organization, the Guide Dog Foundation for the Blind, were the first two assistance dog schools in the United States accredited by both Assistance Dogs International and the International Guide Dog Federation.